At this step, you can create finite difference grids for MODFLOW, unstructured grids for MODFLOW-USG, or finite element meshes for a FEFLOW run. The Conceptual Model has been defined. A numerical grid or mesh is created. Once you have created your conceptual model you can discretize your model using either the finite difference method, unstructured finite volume (Control Volume Finite Difference, CVFD) or the finite element method. The finite difference method involves fitting your conceptual model to one or more finite difference grids. The CVFD method (used in MODFLOW-USG), allows you to conform the grid to your wells and boundary conditions. For MODFLOW-based numerical models, after conversion, the resulting numerical model can be viewed/edited and then simulated in the Visual MODFLOW Flex environment. 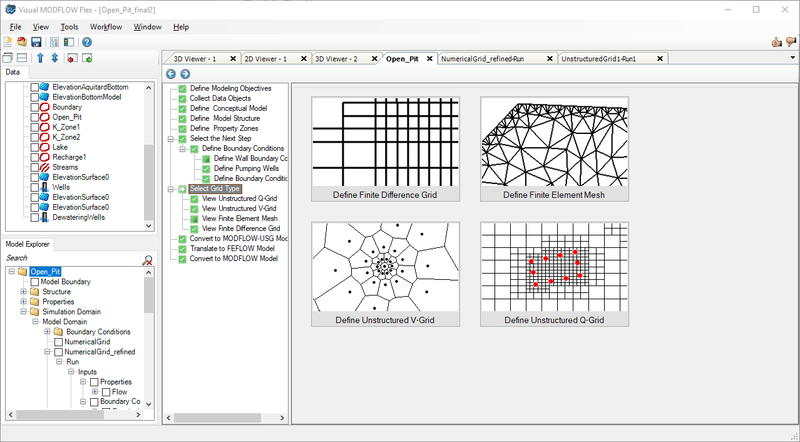 The finite element method involves fitting your conceptual model to a finite element mesh. Once translated, a FEFLOW ASCII .FEM file is created (and saved on the hard disk), which can then be opened and simulated using FEFLOW. Please Note: a license of FEFLOW v.5.4 or above is required to open FEFLOW .FEM files generated from Visual MODFLOW Flex.